RTG launched a new game today and Grande Vegas Casino has some bonus money and even some free spins, if you want to try it. The new Ghost Ship is a dark and mysterious new slot game where a spooky crew guards hidden treasure aboard a haunted pirate ship. The casino will give give you a $125 casino bonus as well as 25 free spins to take it for a spin. To get a 125% bonus (up to $125) use bonus code GHOSTSHIP125. You'll also get 25 free spins when you use this code as you deposit. 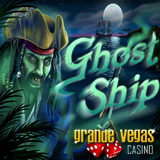 Get an up to $125 casino bonus plus 25 free spins when you try the new Ghost Ship slot at Grande Vegas Casino. In the new Ghost Ship slot, the Wild symbol (a Ghost Captain) and the Scatter (a Ghost Ship) can both expand to fill the entire reel. Ghost Captains expand every time when you're in Free Spins. Ghost Ships trigger free spins if you get three or more. You get two free spins for each Ghost Captain or Ghost Ship in the triggering spin. Prizes are multiplied by 10X if five Scatters trigger the bonus round. I told you recently about Grande Vegas' 25% Cashback program that refunds some of your last deposit if your account gets low. Next week I'll have news about a new game in their mobile casino.